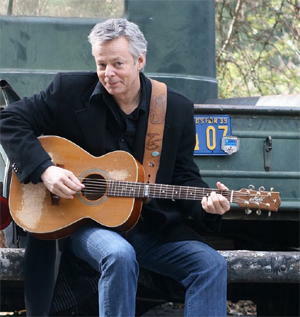 Tommy Emmanuel is an acoustic guitar virtuoso who has delighted fans with his complicated fingerstyle technique. He has been playing Maton guitars for most of his career. A long-standing fan of Chet Atkins, he recorded the album “The Day Finger Pickers Took Over The World” with Atkins. The album also turned out the be the last Atkins ever recorded. Tommy still performs at the Chet Atkins Appreciation Society every July in Nashville. He recently wrapped a tour alongside Martin Taylor. Maximum Ink: What was it like being taught to accompany your mother on steel guitar when you were only 4? Do you think,looking back, those are some of your most fond memories? What do you think is the most important thing you learned from her? Tommy Emmanuel: It was so long ago, it’s hard to remember everything. I recall it was exciting to play music with my mother – every day I looked forward to hearing the school bell, knowing that I would run across the road to our home and my mum would be waiting to play. She showed me some songs that were simple and easy to remember. She taught me how a song is constructed, to know the difference between the verse and the chorus and the bridge, and to look out for key changes. I think I learned the importance of melody against chords through learning all these songs. MI: Do you remember what it was like to work as musician at the age of 6? Did you ever get stage fright when you first started playing to crowds? TE: I was never afraid of going on stage – in fact, the opposite is true; I couldn’t wait to get out there. I’m just the same today. MI: I read somewhere that you vividly remember the first time you heard Chet Atkins on the radio, can you tell us a little about what that moment was like for you back then? TE: I heard Chet on the radio and it sounded better than anything I’d ever heard. There was a power and great tone in his playing, and at the same time, it was very commercial-sounding for its day. Everybody was attracted to Chet’s records. I recall thinking, “I want to do that.” He sounded better than everyone else. MI: What was Chet Atkins like? Aside from his playing, what did you love most about him? TE: He was a guy who loved life and loved people and was fascinated by human achievement. He taught me to appreciate the cleverness of some people and to not forget the simpler things of life. His positive attitude and humble approach with me and everybody else around him, made life seem like it was full of possibilities. MI: What do you love most about playing the guitar? TE: The fun it brings to people to hear and watch it. It is a weapon of mass construction! MI: Why do you prefer to use Maton guitars? TE: I like everything about them. They feel great, they sound good, and when you plug them in, no other guitar comes close. I like many brands of guitars, but for me, the Maton is the complete package. MI: What was it like to perform with your brother Phil at the closing ceremony of the Summer Olympics in Sydney in 2000? TE: Two words: exhilarating and unforgettable. We played live using inner-ear monitors and Line 6 pods. We played to a backing track, but we were live. It was such a big event that the rehearsals went for two weeks. It was an amazing achievement and I was so proud of my country for hosting this amazing event. MI: Do you think certain talents such as musical ability are inherited to a certain extent? TE: I think a person’s desires and abilities are definitely handed on through the generations, but those who do well with their abilities are the ones who are willing to put in the work and be dedicated, and who are willing to sacrifice for its fruition. MI: Why do you think music has been such a powerful force throughout the ages? TE: Music goes back to the dawn of civilization. There’s a principle here: sing to that which is unproductive and it will be productive. Nature will always answer your call. In the same way that native Americans would sing to their crops to make a good harvest, I play to the people to try to make their lives better. MI: Do you ever wonder where your life would be now, if not for the music? TE: I cannot imagine one day without music – it would be sad! MI: Do you still enjoying touring as much as you did early in your career? TE: I enjoy touring more than ever, because I’m not just a player in a band. These are my concerts and I have a greater obligation to the audience to give more of myself. MI: Is it true you don’t use set lists? Why is that? TE: I only use a set list if I’m working with a band or orchestra so that people know what’s coming next. When I work on my own, I don’t need a set list – I decide what I’m playing on the fly based on being in the moment. MI: I read somewhere that Steve Vai considers you one of the most inspired acoustic guitar players he has ever seen. What are your feelings on that? How does it feel to have guitarist from all various skill levels admire your work? TE: I’m just one of millions of guitar players around the world. We are like a brotherhood and sisterhood and we are all different. Steve has been a good friend to me and his words are always encouraging. The funny thing is, we are all so busy that sometimes we have to communicate with each other through interviews like this! MI: What advice would you offer the beginning guitarist? TE: Learn some good songs. Keep it simple and give yourself lots of time. MI: Is there any one moment that you consider to be the highlight of your career? TE:No…every day above ground is a good one for me. What’s next is what’s intriguing to me. A life in music is filled with endless possibilities. TE: I’m always hoping to write more songs, but I’ve been practicing some Jerry Reed songs recently, to play them better. I have a new solo album in the works and also an album of love song covers with John Knowles as well. We are busy boys! MI: What do you think is the key to a life well lived? TE: Everything in moderation. Keep things simple, don’t get greedy, and be generous. MI: If you don’t mind my asking what are your personal feelings on death and what comes after? How do you hope to be remembered when your time comes? TE: Death does not sadden me, it’s just part of life. I have never cried at a funeral. I don’t worry about being remembered, I just do the best I can while I’m here. I certainly don’t know what will happen to me after I die, nobody does! TE: Music is one of the best ways to communicate feelings and ideas, so use it wisely.